Have a question on Mulsanne? Mulsanne is available in 11 different colors - Tungsten Silver, Pale Sapphire, Pale Velvet Over Black Velvet, Pale Velvet Over Black Velvet, Onyx, Alpine Green, Moonbeam, Fountain Blue, Damson, Rose Gold Over Magnetic and Pale Brodgar Over Brodgar. Watch latest video reviews of Bentley Mulsanne to know about its interiors, exteriors, performance, mileage and more. When it comes to a wealth of handcrafted details, with top-notch technology aspects Mulsanne is one such car that offers peerless traveling experience. For Bentley every minute detail matters and presenting each detail in a unique manner makes all the difference in the automobile world, presenting Bentley a class that is defined by the name. Recognized for high power and tremendous acceleration, Bentley Mulsanne has gained a massive appreciation across different geographies. In the market like UAE where utmost luxury is in demand, Mulsanne holds a dominant position to boost the company's market share in an effective manner. Mulsanne is surrounded with extensive luxury features inside the cabin, the very aura of which feels like an oasis of peace. The interior designs are chiseled in a manner that not only brings an accord ambiance but, also increase the overall driving experience of the driver. The twin electrically deployed picnic table with concealed iPad holders along with Bentley premium audio system with exclusive features offers everything the audiophile demands. The LED door casing strips, B-pillar up-lighters, roof console waterfall lighting front and rear and foot well lighting enhance the visibility. A bottle cooler with exuberant detailing, 8-inch HD color-screen for media as well as navigation further add to the comfort features. Mulsanne appoints an impressive boot space measuring 443-litres which is decent to say the least. A sight to behold, Bentley is carved with super-performing technology that gives striking design lines that are sharp and bestow a unique aura of power and refinement. The large round headlamps are instantly recognizable that are further accompanied with Bentley matrix grille covering the radiator and adding to the eye catching look of Mulsanne. The overall dimensions of the car stand out to be 5575mm X 1926mm X 1521mm (L X B X H) and the wheelbase of the car measures 3266 mm that is quite impressive for making provisions for ample legroom as well as cabin space. Bentley Mulsanne is available in alloy wheels of size 20 inches and 21 inches. The tires for 20 inch rims measure 265/45 R20 while that for 21 inch rims measure 265/40 R21. The Mulsanne features a re-calibrated V8 engine, with 13% efficiency improvement that produces a large torque and impressive power. The humongous 6.8-Litre engine is coupled with 8 speed automatic transmission that ensures an effortless driving and delivers a maximum power of 512 Ps at 4200 rpm along with a peak toque of 1020 Nm at 1750 rpm. The car can attain 0-100 kmph mark in 5.3 seconds with a top speed of 296 kmph and as it appoints a thirst engine the mileage will not be something that one should look for. But, the figure of 14.6 L/100 km is significant for such a massive engine. The aid suspension with regularly variable damping adds to a more refined ride and Drive Dynamics Control system further allows a driver to tune the suspension with the steering controls. Iron brakes with black painted brake calipers are further coupled with Anti – Lock Braking System (ABS), Electronic Brake Force Distribution System (EBD), Brake Assist (BA) and Hill Hold Control for effective stability and braking of the car. The ESC Premium safety system uses the radar sensors to scan the route ahead and alarms the user in case of a possible collision. The Air Bag System (Front, side and curtain) along with Hill Start Assist (HSA), front and rear seat-belts with pretensioners further adds to the safety features of the car. Enormous space for personalization, limited by imagination, Bentley Mulsanne is truly in a league extra-ordinaire. 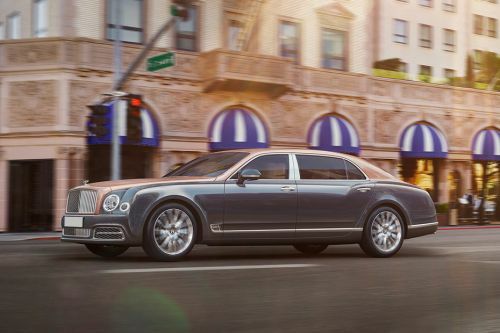 The royalty delivered by Bentley Mulsanne can only be matched by Rolls Royce Phantom, and even the epitome of luxury might find it difficult to provide the overall drive experience of Mulsanne. What are the colors options available in Bentley Mulsanne?